On August 10-13, there was the 30 Annual Walking Pilgrimage from Great Meadows to Doyleston(American Czestochowa). Several of our parishioners went, and they have shared their pictures to show us the experience. 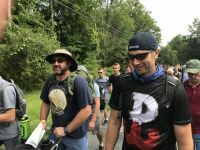 The pilgrimage is 56.5 miles, and it spans over 4 days, with about 4,000 people attending this year. We welcome you to look at these photos, and they can be found HERE. We hope, that these pictures motivate others next year to go on this pilgrimage. See you in a year!